Carrots & Zucchini watch out. 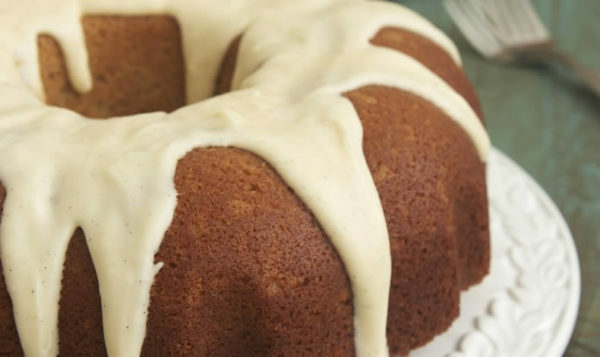 Asparagus is the new kid on the block for rich bundt cakes. In a large bowl, combine the first five ingredients. Add oil, eggs, asparagus, pineapple, orange zest and vanilla; mix well. Fold in pecans. Pour into a greased and floured 10-in. Bundt cake pan. Bake at 350° for 1 hour or until a toothpick inserted in the center comes out clean. Cool for 10 minutes; remove from pan to a wire rack to cool completely. For icing, beat cream cheese and sugar in a small bowl until smooth. Add orange zest, vanilla and enough milk until icing reaches desired consistency. Spoon over cake, allowing icing to drip down sides.